Where do I find my BCC address in Salesforce? /Browser Extensions / Auto BCC for Gmail / Browser Extensions /Misc Instructions /Browser Extensions / MailKing / Where do I find my BCC address in Salesforce? Find your user name at the upper right corner and select the drop down bar. Select “My Settings” or “Setup” from the drop down bar. 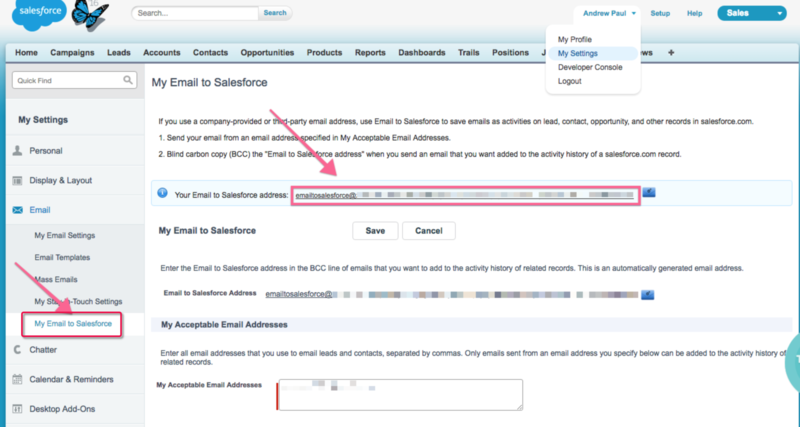 Note: Make sure the beginning of your BCC address reads: emailstosalesforce.